Iraqi Prime Minister Nouri al-Maliki announced today that his government will take immediate action against sectarian militias of all stripes in Baghdad. Prime Minister al-Maliki also said on Saturday that Saddam Hussein’s execution was a ”domestic affair” and warned countries which have criticised the hanging that his government could review relations with them. This short excerpt from a speech, in a prominent Najaf mosque, is a warning to oppressive dictators in the Arab world. Saddam was seen as a powerful immovable figure, now he is gone. 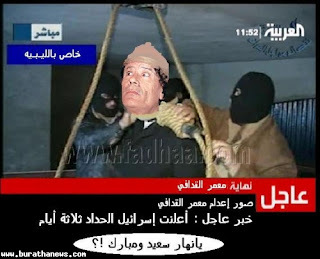 If this can happen to Saddam then the rest of the dictators (including some Arab crowns) could be next. The ripple effect has already been felt. * Saudi Arabia has held municipal elections and is allowing women to work for the government, and is promising to expand on that. * Kuwait has given women the vote and the ability to run for the national council. * Jordan had municipal elections. * Egypt is slowly shifting towards fair elections. * A number of the Gulf States are heading towards parliamentary or constitutional monarchy. * Lebanon forced Syrian military out etc. Many of these steps towards better citizen representation and increasing women’s rights, are some times symbolic and mostly small. They are steps none the less, steps in the right direction. I spoke to my father In Baghdad twice since the execution of Saddam. The general consensus is that of relief to be rid of Saddam. There is also apprehension over the relative little violent activity since Saddam’s execution. Is it the calm before a storm or a signal of declining violence he exclaimed? Our news has reported attacks on the Shiite Askariah shrines in Samara (north of Baghdad). These shrines were bombed by terrorist early in 2006 and sparked the increase in violence (in central Iraq) we have witnessed in 2006. The attacks on the Askariah shrines (by Sunni Arabs) shortly after Saddam’s execution consisted of a break-in and demonstration carrying a symbolic coffin. This was a definite move to provoke the Arab Shiites to retaliate. Shiite leaders, including Muqtada, have called for calm and restraint against the few Sunni Arab demonstrations and provocations. This restraint is nervously holding. I continue to point out that Sunni Kurds and Shiite Arabs in Iraq are not fighting each other. Kurd Sunnis and Arab Shiites have formed a democratically elected cooperative government and are working hard to assure the Sunni Arabs are not under-represented. In fact Arab Sunnis have a higher percentage of ministerial positions in the government than the percentage of votes they received in the Iraqi parliament. This Arab Sunni-Shiite violent conflict is a result of Saddam’s oppressive regime. While growing up in Iraq in the 60’s and 70’s Shiite-Sunni friction was non existent. Many Iraqi families (including my family) have Sunni and Shiite members. Claims that Shiites and Sunnis have been fighting each other for hundreds of year are entirely false. Iraq the Model talks more about crisscrossing those Iraqi sectarian lines- something we don’t hear about in the West. Jules Crittenden says Al-Maliki “got religion”.